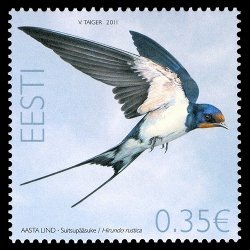 The national bird of Estonia is the Barn Swallow Hirundo rustica. Of course, in Estonia the bird is not called Barn Swallow. 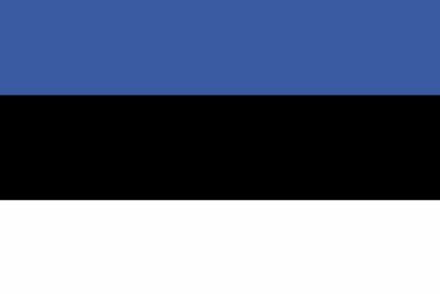 In Estonian the term is Suitsupääsukese which, when translated by Google, comes out as Smoke Swallow. * According to a report by sixth-graders at the International School of Estonia Suitsupääsukese was chosen as the national bird “because of a campaign conducted by ornithologists at the beginning of the sixties.” The campaign probably had to do with the fact that the Estonian Ornithogical Society has the Barn Swallow as a logo and their journal is the Hirundo. Since 1995 that same Estonian Ornithological Society has chosen a bird as the bird of the year and this year, 2011, it is the Barn Swallow! The point of Estonia’s bird of the year selection is that it “helps to draw attention to one certain bird species, to study its habits more widely and to provide information to a larger audience.” What is neat is that the country as a whole gets into the bird of the year and the postal service in Estonia even issues a stamp and other postal materials each year to commemorate the selection of the bird of the year. The Barn Swallow has graced more than a stamp. Before Estonia switched over to the Euro the back of the 500-kroon note was graced by the national bird. Estonia is not the only country to have the Barn Swallow as the national bird. Austria also so honors Hirundo rustica though that honor is watered down a bit by the national animal of Austria, which is the Golden Eagle. Here’s hoping that the Barn Swallow‘s selection as the bird of the year in Estonia will result in more attention being paid to its declining population in Estonia and everywhere! *Though I also found Räästapääsukese, which translates to Eaves Swallow, a perfect name for a bird that nests under the eaves of barns and other structures.